You can have a maximum of 10 clients per Nest developer account. When creating a new developer account, you must provide a real email address. We validate the email address that you provide. For all other fields, we don't do any validation. When you have actual users, you can update your company and client profiles, as needed. Client name cannot contain "Nest" or "Works with Nest"
To create a client, visit the OAuth Clients page, select [CREATE NEW OAUTH CLIENT], and complete the form in the OAuth Client details page. 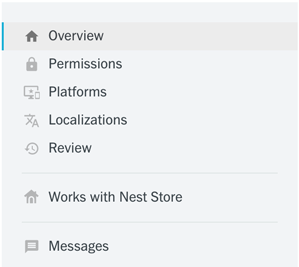 Cannot include "Nest" or "Works with Nest"
Select permissions and write descriptions. Choose permissions thoughtfully—if you change permissions later, your users will be asked to re-authorize your product. Select [CREATE] to register your product.